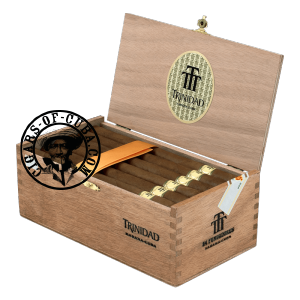 Rumored to be Castro's favorite cigar and used as the Official Cuban Diplomatic cigar for a number of years (Cohiba now has this role), the Trinidad Fundadores is pure elegance. The cigar is perfectly paced, giving you a smooth, creamy smoke full of rich beany (honey, coffee and vanilla) flavors. The cigar does not need huge power to give it body, as the balance comes from the equilibrium between rich flavor and perfect construction. This is regarded to be one of the finest cigars ever produced. A medium-strong flavor with hints of leather and cream.